A new year has started and we at SK Gaming are once again proud to announce a strong mixture of teams in different games. This article should also express many thanks to all of our teams and players who helped and stood beside SK Gaming in 2009 and also to those who yet will be a part of the team in 2010. 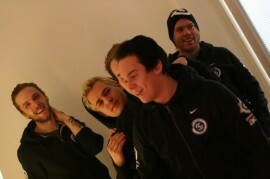 SK Gaming consisting of Dennis 'walle' Wallenberg, Robert 'RobbaN' Dahlstr&ouml;m, Jimmy 'allen' Allen, Johan 'face' Klasson & Frej 'kHRYSTAL' Sj&ouml;str&ouml;m have now been playing together for about 3 months and have achieved some outstanding results for such a new team. The addition of our two youngsters face & kHRYSTAL indeed helped the team around walle, RobbaN and allen back to the top, achieving gold medals at the Extreme Masters Global Challenge in Chengdu, IEF 2009 and Arbalet Cup Europe 2009 in Stockholm. So where will you be seeing the rocksteady team of SK Gaming next? The IOL regional qualifier at the end of this month and the Extreme Masters Global Finals in march for which the team has already qualified! Our one man army Quake Live roster headed very successfully by Shane 'rapha' Hendrixson will continue as before. Clearly dominating 2009 with achievements such as winning gold at the Extreme Masters Global Challenge in Cologne and Dubai or taking home gold at the QuakeCon 2009 Rapha futhermore has the drive to continue his streak in 2010. You will be able to see Shane 'rapha' Hendrixson at the upcoming Extreme Masters Global Finals in Hanover in March. Last but not least big thanks go to our Xbox section of SK Gaming. They joined us early 2009 as Evil Axis and today contain the best Console Teams throughout Europe. Be it SK Gaming UK from the United Kingdom who are gaining experience from day to day, the SK Gaming sports roster with our newest addition Azzze who is the best German FIFA player on the console, our SK Gaming racing section who have recently been winning the infamous CHIP.de Online Forza Motorsport 3 cups, all have been living up to a professional standard of E-Sport and are therefore to be gratefully honoured. After June 'Lyn' Park leaving the family of SK Gaming the players Hyeong Ju 'Check' Lee and Du Seop 'WhO' Chang will be following, too. At the end of the day this means SK Gaming will be starting off 2010 without a Warcraft 3 squad. Will you see new WC3 faces at SK - Time will tell! At this point we want to thank Check and WhO for their successful stay at SK Gaming. We are more than happy to have signed our CS team for yet another year. The mix of two very experienced players, one in between and two young guns makes the roster extremely exciting to follow. With last years kick-off in Chengdu, a 3rd place in Dubai and both victories at IEF in Korea and Arbalet in Stockholm we are looking forward to an intense 2010. Most fans just take it for granted, looking at the SK match ticker and seeing that the xbox division once again won another match, league or tournament. We don't. We appreciate each and every victory as we know it is earned with a lot of passion that these guys bring to the console! On top of that this squad has it's own sponsorship with Bigben which makes it unique within SK. We are more than happy having these guys around! Once again we hereby want to thank all of our loyal fans who supported us throughout the year of 2009!